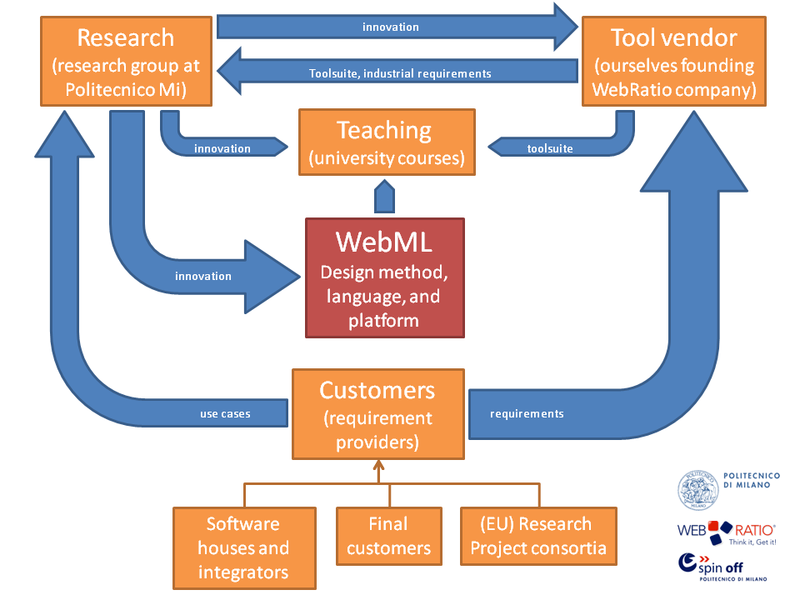 Tomorrow we will celebrate 10 years of WebRatio: this is a good occasion for thinking about the path that led from a university research project to a recognized modeling language (WebML) and a solid, industrialized version of a toolsuite (WebRatio). – and the professional developers and analysts at Web Models that work hard for making a good product out of the rough ideas and experiments produced in the university. While research provides innovation to both teaching and industrialization, and finally produces the upto date version of the language and methodology. The tool vendor provides the tool itself and also requirements coming from real industrial customers. The tool is extremely useful for teaching and research purposes not only within our group, but throughout the world (thanks to an academic program that allows education institutions to get free licenses of the tool). The role of customer is crucial in this picture, because it’s from their input (business, technical and UI requirements) that we extract the actual needs of the industry. The whole innovation cycle start there. Furthermore, customers provide feedback and feasibility/acceptability check upon our findings and solutions. As I already commented on modeling-languages.com, our experience is quite similar to the one of the ATL research group in Nantes.